Brave New Electronic World- This guide is intended to be an overview of appropriate etiquette for interaction in online environments. Tone Down Your Language - Given the absence of face-to-face clues, written text can easily be misinterpreted. Avoid the use of strong or offensive language and the excessive use of exclamation points. If you feel particularly strongly about a point, it may be best to write it first as a draft and then to review it, before posting it, in order to remove any strong language. Keep A Straight Face - In general, avoid humor and sarcasm. These frequently depend either on facial or tone of voice cues absent in text communication or on familiarity with the reader. Be Forgiving - If someone states something that you find offensive, mention this directly to the instructor. Remember that the person contributing to the discussion is also new to this form of communication. What you find offensive may quite possibly have been unintended and can best be cleared up by the instructor. The Recorder Is On - Think carefully about the content of your message before contributing it. Once sent to the group, there is no taking it back. Also, although the grammar and spelling of a message typically are not graded, they do reflect on you, and your audience might not be able to decode misspelled words or poorly constructed sentences. It is a good practice to compose and check your comments in a word-processor before posting them. Test For Clarity - Messages may often appear perfectly clear to you as you compose them, but turn out to be perfectly obtuse to your reader. One way to test for clarity is to read your message aloud to see if it flows smoothly. If you can read it to another person before posting it, even better. Remember Your Place - A Web-based classroom is still a classroom, and comments that would be inappropriate in a regular classroom are likely to be inappropriate in a Web-based course as well. Treat your instructor and your fellow students with respect. Brevity Is Best - Be as concise as possible when contributing to a discussion. Web-based courses require a lot of reading, and your points might be missed if hidden in a flood of text. If you have several points that you want to make, it might be a good idea to post them individually, in several more focused messages, rather than as a single, lengthy, all-encompassing message. Stick To The Point - Contributions to a discussion should have a clear subject header, and you need to stick to the subject. Don't waste others' time by going off on irrelevant tangents. Read First, Write Later - Don't add your comments to a discussion before reading the comments of other students unless the assignment specifically asks you to. Doing so is tantamount to ignoring your fellow students and is rude. Comments related to the content of previous messages should be posted under them to keep related topics organized, and you should specify the person and the particular point you are following up on. 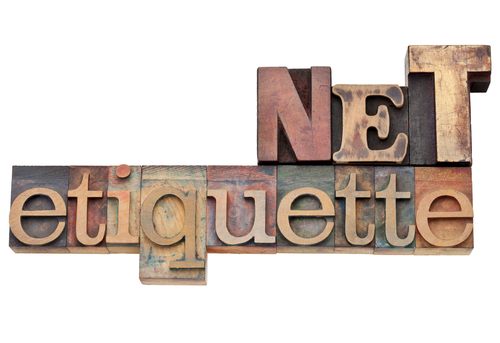 Citations and Other Etiquette Sources -	Many of the points made here were taken from The Core Rules of Netiquette, excerpted from the book Netiquette, by Virginia Shea. The Core Rules of Netiquette can be accessed at http://www.albion.com/netiquette/corerules.html. Further information was taken from Arlene H. Rinaldi's The Net: User Guidelines and Netiquette, which can be found at http://courses.cs.vt.edu/~cs3604/lib/Netiquette/Rinaldi/.